The Snow Witch dwells within the Crystal Caverns. These fabled Caverns are located in the frozen heights of the Icefinger Mountains on Allansia. You are working as a caravan guard for Big Jim Sun when the outpost you are headed to is attacked by a savage monster. Tracking this monster takes you into the long lost labyrinth of the Crystal Caverns... and beyond. 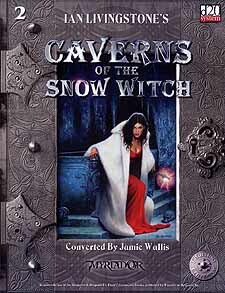 Caverns of the Snow Witch is an adventure designed for single adventurers or small adventuring groups of around 8th level based on the Fighting Fantasy book of the same name.